Today I formulated my beautiful St John’swort and lemon balm infused olive oil into my cold sore salves. Cold sores, aka fever blisters, can be triggered by sun, stress, and lowered immunity. 50 to 80 percent of adults have this virus that rears it’s ugly head at the most inconvenient times. It has to run its course starting with pain and progressing into blisters then drying to its ending. 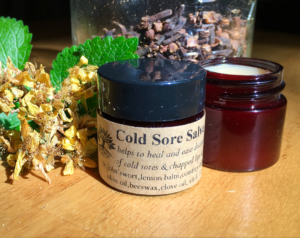 One can’t hurry the process but a dab of analgesic salve may help you feel better along the way of its course. St John’swort is a natural analgesic and antiviral also known to reduce inflammation stimulates circulation thus speeding healing time paired with lemon balm herb with its host of antiviral and calming constituents including rosmarinic acid, flavonoids and phenolic acid make the perfect pair to use during an outbreak. Both herbs have been utilized since before the middle ages for their analgesic and healing properties in tinctures, teas, wine and salves. The duration of a cold sore can be reduced in the healing process by half through use of these wonderful gifts of nature. I add clove oil which contains eugenol, a powerful anesthetic and antiseptic, used by dentists to stop pain and wipe out germs. It has a pleasant taste and is also good for simple chapped lips.